Grand Canyon University honored the victims of Sept. 11, 2001, and veterans in the war against terror with flags and prayers. For the first time, GCU Veterans Center on Monday collected handwritten prayers for victims and survivors of terrorist attacks as well as the men and women fighting the wars. The more than 100 prayer cards will be sent to victim and veteran groups nationwide, said Hattie Douglas, resource coordinator for GCU veterans. The prayers, collected at a table outside the Student Union, were written on index cards decorated with an American flag and GCU Veterans Center emblem. They contained heartfelt wishes for healing and thanks for sacrifices. “I pray that your family is doing good. No one should have that grief. I hope you’ve found peace. God Bless,” wrote one student anonymously. Francisco Quijada, a senior health care administration major, knows first-hand how uplifting prayers from strangers can be in wartime. On Sunday, GCU once again honored the victims of the Sept. 11, 2001 terrorist attacks with a flag for each victim. 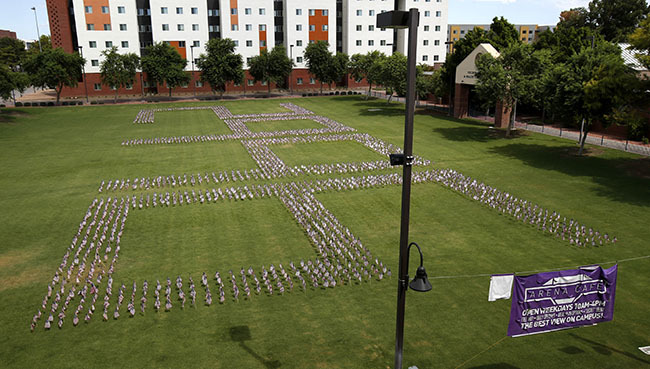 The flags were arranged by the Army ROTC Thunder Battalion on the Quad in the shape of 2,996, the number of those who died in the terrorist attack. In previous years, flags were arranged in the shape of the Twin Towers and the Pentagon. The flags were donated by the National Memorial Cemetery of Arizona.